Grab your coffee, tea or even a glass of wine, and let's start chatting. I've got lots to share. If you are new here, I debuted this column last week in order for me to get back to the basics of blogging which is sharing information, starting conversations, and being true to my voice. I'm a trained journalist, but what I've learned lately after writing for several news organizations is that I love the informal writing style that makes blogs so unique. So, here we are with week 2 with my Southern Tales. Raleigh is in big city leagues when it comes to luxury brands. 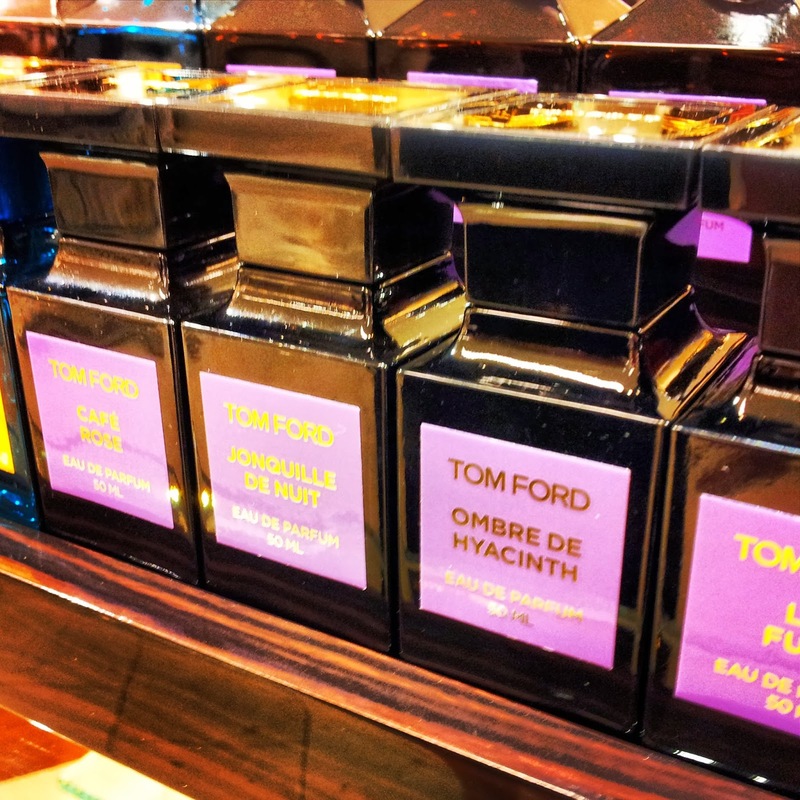 Tom Ford has put his entire Private Blend Collection in the Raleigh Saks along with his lip and nail products. It is truly unusual that a city our size has the entire collection. Currently, this luxury beauty line is only available in big city markets like New York, Dallas, San Francisco, etc. I believe it speaks volumes about the South's sophistication, especially the Raleigh-Durham-Chapel Hill area. 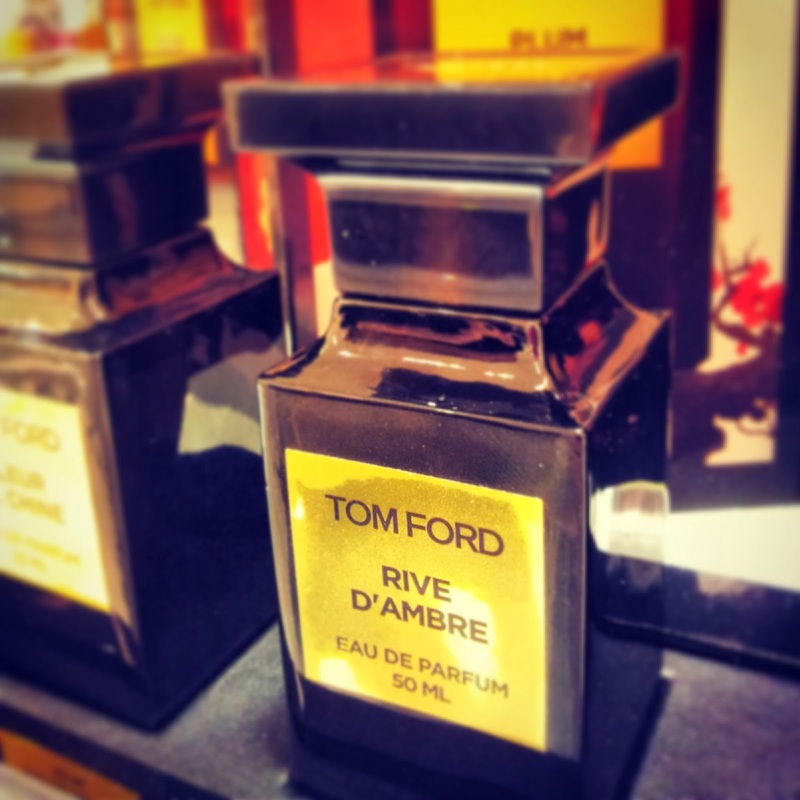 I had lunch with Tom Ford's representative, Amellia Glover, at Saks Raleigh this week. I had a private introduction to the Private Blend Collection. We laughed when I told her that I had the most terrible sense of smell so maybe I wasn't the best person for this assignment. My nose may not be an expert on scents, but I was quite impressed with the notes found in this collection. First off, it's important to note that the Tom Ford Private Blend Collection is non-gender specific, and that is what makes this line special. The scents are not over-powering, and they are in the purest form which means what you smell in the bottle is exactly what it will smell like when you wear it on your skin. Also, these scents are designed for layering. You can wear different combinations to reflect your mood. Since this a luxury brand, you are paying for the best. The bottles are pure craftsmanship. Inspired by the dark brown glass used in apothecary bottles found in perfumers work rooms, the bottles have a look of a chess piece. The smallest size, 50ml is $210. The large decanters are $520. 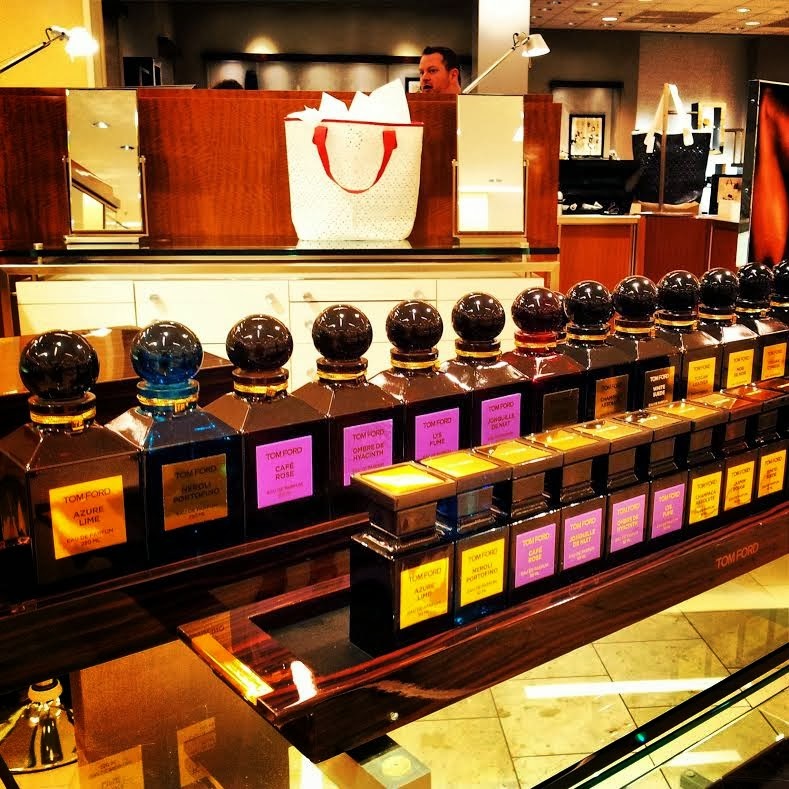 Learning about the Tom Ford Private Blend Collection at Saks is a true experience. You will start by telling Amellia what scents you like, and what appeals to your senses. For example, I told her that I didn't like anything overpowering and that is all I could tell her because honestly, I really didn't know what I liked. I like freshness and I don't want to smell like an old lady wearing too much perfume. I learned so much about myself on this scent journey. I was drawn to citrus, warm vanilla, and scents with oriental influence. My absolute favorite fragrance from the line was Champaca Absolute. Tom Ford's love of the rare and expensive Champaca blooms fueled his desire to create this floral-oriental composition. The blooms must be gathered by the thousands to produce a single bottle of this fragrance. It's white-flower heart is given dimension through layers of cognac, vanilla bean, and sandalwood. 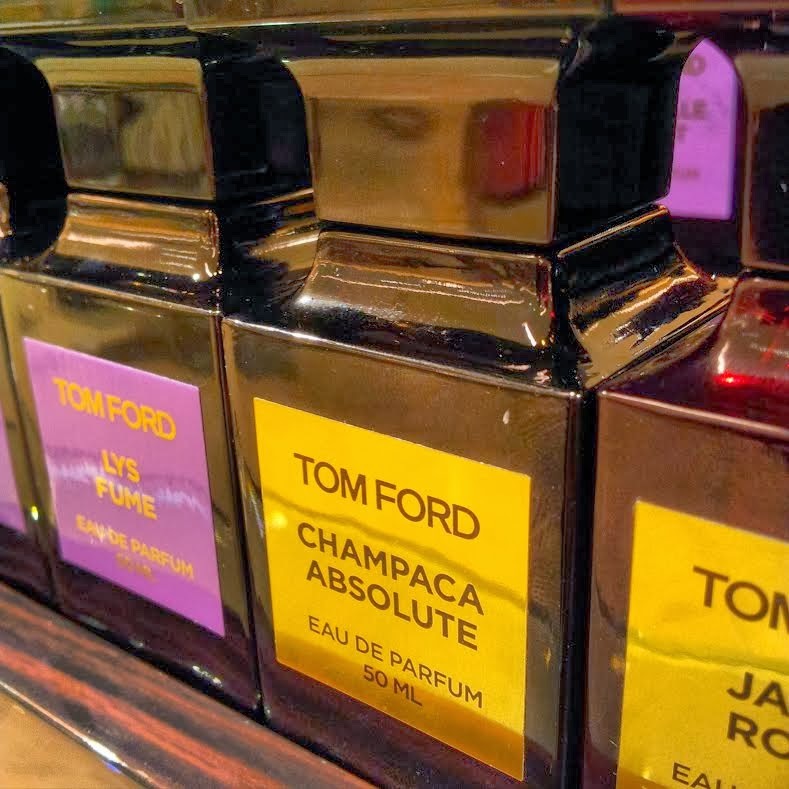 It's also important to note that the Tom Ford Private Blend Collection has a lot of scents, and I liked many, but I'm only highlighting what I would buy if I stole Will's credit card and could get away it without him knowing it was me. Ameilla changed the scent of Champaca Absolute by layering it with a few other blends. Throughout all of our time together, I kept going back to Champaca Absolute so we ended up marking that one as a favorite. Tom Ford also has the Jardin Noir Collection, and one of the most popular scents in this collection is Cafe Rose. I also like Noir De Noir, another Oriental scent with notes of saffron, black truffle, vanilla, and other florals as well as notes of masculine earthiness. It's nice. The Neroli Portofino collection stands out from the other collection with a vibrant, azure-blue packaging. 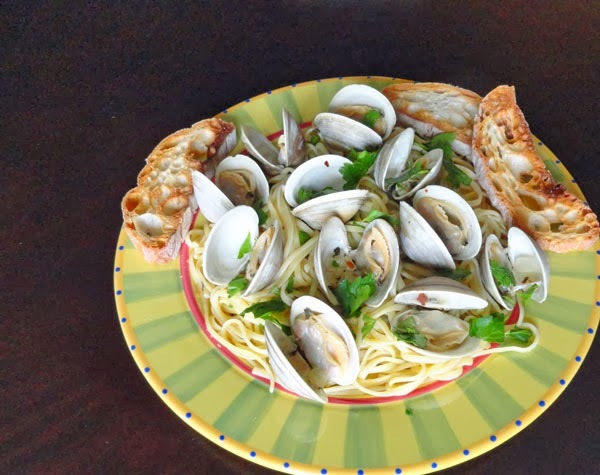 This is very fresh with ingredients with notes of herbs, lavender, and citrus. The Neroli Portofino collection includes bath soap, shower gel, body moisturizer, and body oil. The body moisturizer is $65 for 5 oz. My nose also guided me toward the Private Blend Atelier D'Orient Collection, inspired by the beauty and luxury of Asia. This collection uses ingredients that have treasured prestige in the Orient. I loved Rive D'Ambre. This is a golden-toned perfume with exquisite citrus fruits. Yeah, I'm back to citrus again. There is so much more to talk about with this collection and his nail and lip line, but I'll save that for another Sunday. Have you tried the Tom Ford Private Blend Collection? It's Beauty Week at Saks right now. Do we get enough Iodine in our diets today? I have become obsessed lately with iodine consumption. I guess you didn't know that my middle name is "Hypochrondiac." I recently read in a journal that stated several doctors who practice holistic medicine believe that the daily recommended iodine intake of 150 mcg is too low for our needs. They believe that more and more Americans are not getting sufficient iodine in our diets, and that the daily recommended intake should be higher. Iodine is important for thyroid function, brain function, and some believe it is essential in cancer prevention. But, too much iodine is a bad thing, too so you really have to be careful. It's not wise to go self-diagnosing yourself with over-the-counter supplements. After reading the journal, I immediately went to look at my vitamins, and iodine was completely missing from the ingredients. I get no iodine from my multi-vitamin all. That's bad. 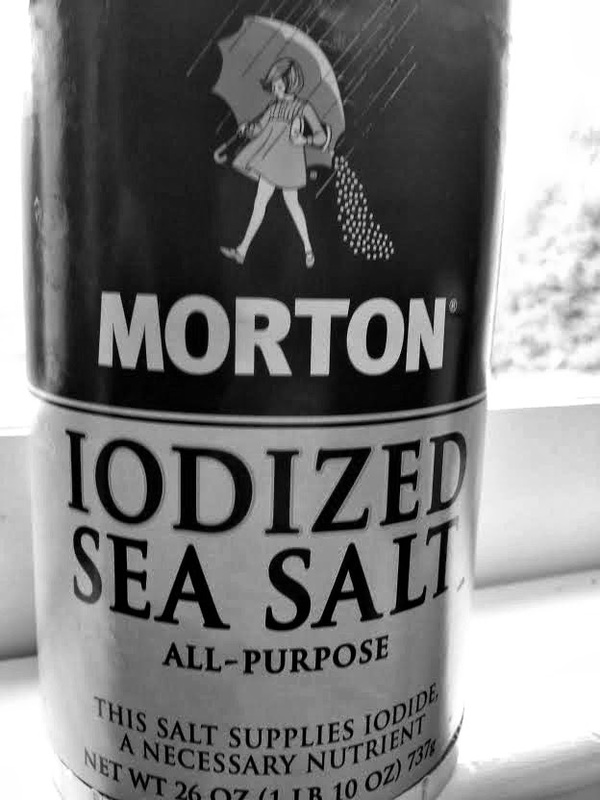 I cook with iodized sea salt, but to get enough iodine to meet the suggested daily requirement, you would need to digest a whole teaspoon. Seaweed is one of the best sources for iodine, but I'll be honest here. I don't remember when I ate seaweed last. I'm not sure if I've eaten it at all. Maybe I need to find me some seaweed chips. Dairy and grain products are another source of iodine, but it is not on the packaging of how much iodine is in the products. I found this table online with some general guidelines of how much iodine is in our food. Fruits and vegetables have iodine, too, but it depends more on the type of soil used when they were in the garden whether or not you get a good inake. Three ounces of canned tuna has 17 mcg of iodine. An egg has 24 mcg of iodine. I am truly seeing a pattern that I may not be getting enough in my diet daily. One cup of milk has 50 mcg of iodine. I may get that in cereal, but the only time I drink milk is when it's in my tea. Yogurt may be my best source with 75 mcg of iodine per one cup. Anyway, it's been on mind lately so check your vitamins to see if iodine is listed. I think I'm going to buy a different vitamin now. The downside is that I just bought these and they are for 180 days. I also need to up my intake of cod and shrimp which are more good sources of iodine. 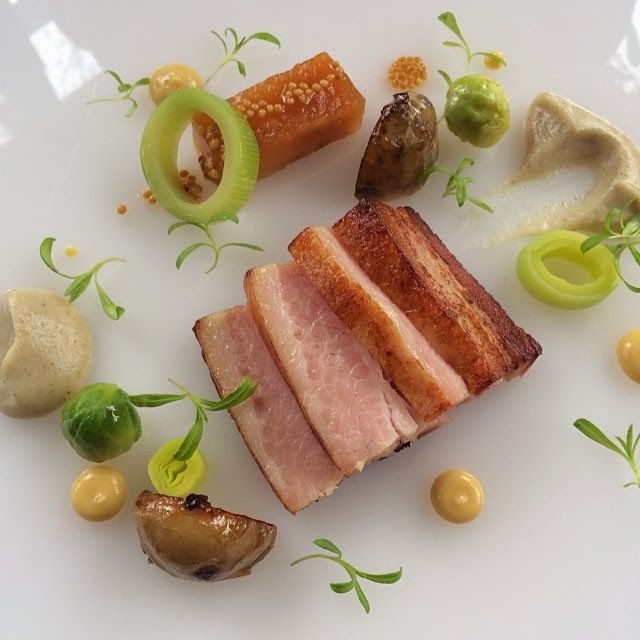 The Fearrington House Restaurant in Pittsboro, N.C. is a semifinalist in the Outstanding Restaurant category for the 2014 James Beard Awards. Eight N.C. chefs are also semifinalists for the category of Best Chef: Southeast. I have that story on Examiner.com this week, but I think this just shows that N.C. is a great culinary state. Take a look at the list, and let me know if you've been to any of these restaurants. I've only been to a few. 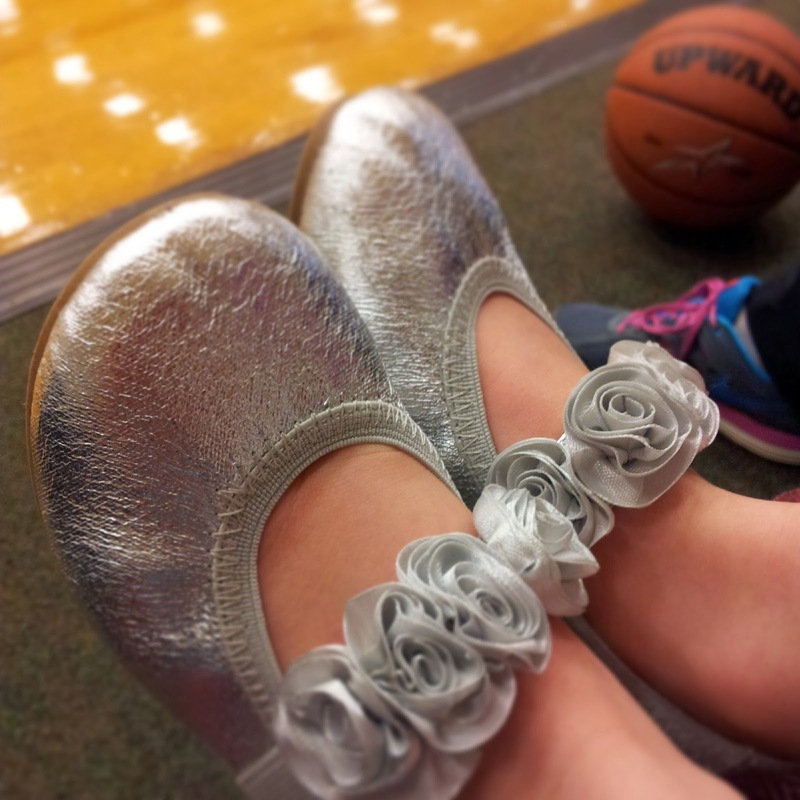 Michael Kors for little feet. Well, the Diva's new Michael Kors shoes that I picked up last week at Marshalls for $19 won my Instagram community over this week. 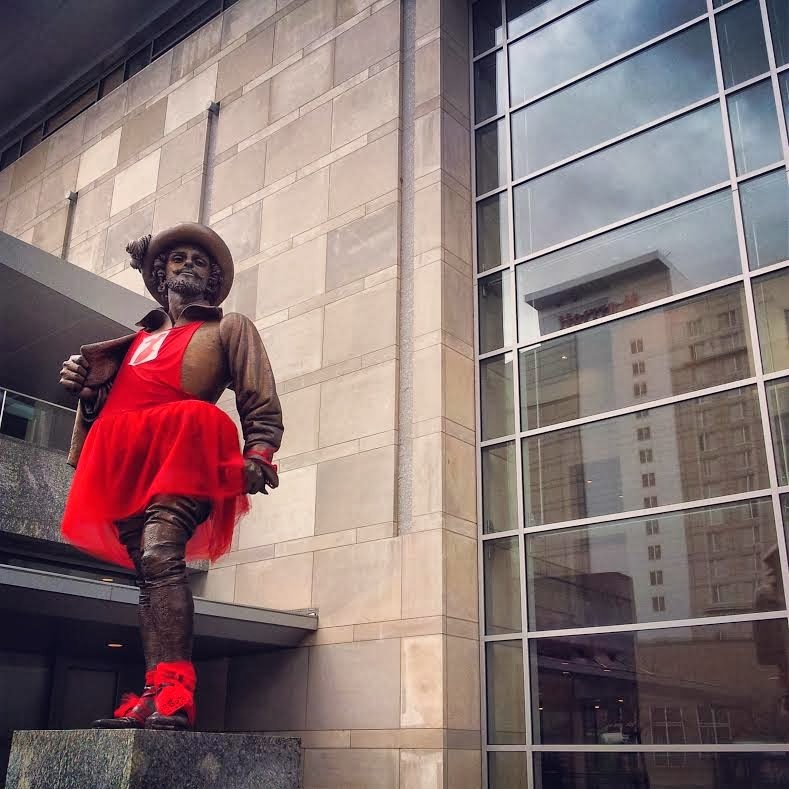 She got over 40 likes for showing off her little feet at her brother's basketball practice whereas the photo of Sir Walter Raleigh in red dress in front of the Raleigh's convention center bombed. Less than 20 people even noticed in my feed that he was wearing a dress. Is it just bad to put Sir Walter Raleigh in a dress? Sir Walter Raleigh decked out in red. Triangle friends, I want to introduce you to another local blogger, Kim Alexander, who has a blog with a very local flair. Her blog is called Triangle Localista. We've been at several events together, and I think you will enjoy reading about the local side of Durham, Chapel Hill, and Raleigh. Kim is a real foodie who can cook like a foodie unlike me. I have to follow recipes. She recently participated in a social media campaign with Locals Seafood for the Winter Seafood Jubilee. I was so impressed with her recipes and have that story on Examiner.com. There are a few more events scheduled this week for the jubilee. I"ll be back Thursday with another hotel feature for #IGTRAVELThursday. Don't forget you can find me on Facebook, Twitter, Instagram, Google +, and Pinterest during the week. Talk to me!